This DIY shower jelly is easy to make and fun to use. This is a great gift idea for preteens or teens, but the whole family will love it. This DIY shower jelly recipe is inspired by the Lush product. The closest place to get Lush products is over an hour from my home, so we can't just stop in to see the pretty things as often as we'd like. Dakota is 11 now, and she loves anything bath related. Bath bombs, fun smelling soap, shaped soap, it's all on her wish list. She had never seen or used a shower jelly, so I wanted to make this for her. I also made it because they are fun for sensory input. 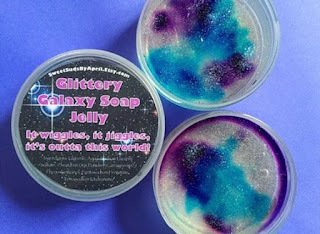 They are wiggly like slime, so they are fun to hold while you wash your hands. Caleb is a sensory seeker. He needs to have slime or something with a fun texture while he homeschools to keep him focused and provide sensory input. I was hoping that this would make bath time a little more fun for him since they have a fun texture and great smell. 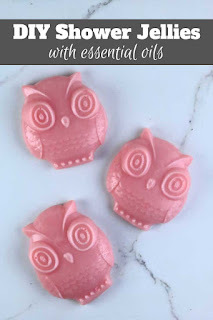 Unflavored gelatin is what makes these DIY shower jelly soaps so much fun! It makes them feel like Jello Jigglers, and what kid doesn't love Jigglers? Be sure to use unflavored gelatin and not a flavored one. 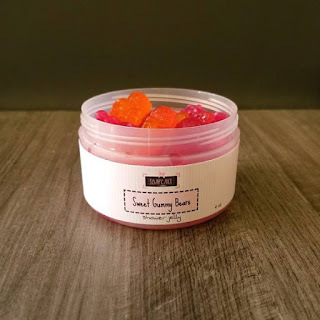 I used the Knox brand that you can find at most grocery stores with the gelatin. Some shower jelly recipes call for body wash, but I prefer liquid castile soap. It's very mild, so it doesn't bother my eczema. One thing to keep in mind with liquid castile soap is that pure castile soap is made with only olive oil, so it doesn't lather well. Some brands also add coconut oil or other oils to increase lather. Lather and suds are just a marketing gimmick to make you think that you're getting clean. You don't need suds to really get clean. I use Crafty Bubbles liquid castile soap, and it has coconut oil added to increase suds. Dr. Bronner's also has coconut oil I believe, so your soap should suds fairly well if you use either one of those brands. I added table salt because it thickens liquid soap. Salt doesn't thicken a coconut oil based soap as well as an olive oil soap. The Crafty Bubbles soap has more olive oil than coconut oil, but Dr. Bronner's has more coconut oil than olive oil, so salt may not work as well. I have heard that there are different formulas of Dr. Bronner's soap depending on the additives and even what part of the world you're in, so keep that in mind as well. I wanted to use essential oils, and I wanted a fall scent, so I chose the new Apple Pie Spice essential oil blend from Crafty Bubbles. It's a blend of cassia, nutmeg, all spice, and cardamom. Even though it's the spice blend and doesn't have apple in it, it smells so crisp and fresh. It's quickly becoming one of my favorites. They released four new essential oil blends this year, Pumpkin Pie Spice, Apple Pie Spice, Gingerbread, and Candy Cane. I'll be using all four of them, so you might be interested in the four pack to have all of them. I love owls. My grandmother collected owls, and I've kept up the same tradition. Dakota, whose middle name is after my grandmother, also loves owls. 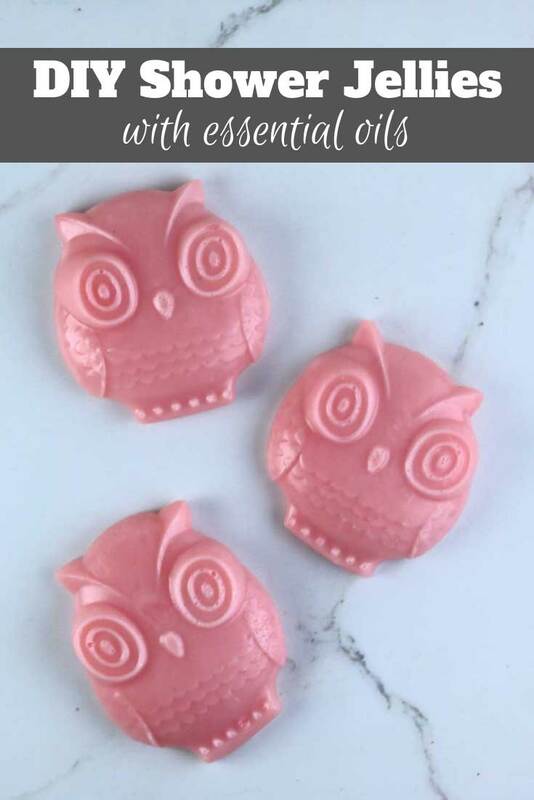 So we used an owl silicone mold. I used this mold, but you can use any mold. It's best to make this in a silicone mold. They can tear when you unmold them, so you need to kind of pull the mold away from the jelly and not pull the jelly away from the mold if that makes sense. Pour the unflavored gelatin in the bottom of a heat proof bowl. I used my 4-cup Pyrex measuring up. Heat the water to boiling and then pour into the gelatin. Use a whisk to stir until there are no lumps. Add the liquid castile soap, salt, soap colorant, Apple Pie Spice essential oil blend, and glitter or mica if you're using it. Stir well. Set your silicone mold on top of a cookie sheet or other flat surface that you can use to move the mold to the fridge later. Carefully pour the melted soap into your silicone mold. You will have a lot of air bubbles on the top of the soap. They won't affect the soap at all, but they don't look really pretty. If you want to get rid of them, spray with rubbing alcohol. Carefully move the tray that the mold is on to the fridge. This needs to cool to set up. If you would leave this on the counter for a few hours because you took your daughter to play practice and forgot to put it in the fridge, don't worry, it will still set up when you put it in the fridge. When it's fully set up in a few hours, unmold the DIY shower jelly soap. Mine wanted to stick to the mold, but as soon as I got one edge to release, the rest of it released fairly easy. To use, get the shower jelly wet and lather it between your hands. Depending on your liquid castile soap, it may not lather that much. Don't worry, you don't need suds to get clean. It's important to store these in a dry area and preferably where they won't touch. They may stick together if they touch. If they get moist or even sit in humid weather, they will start to flatten. I turned my air off, and mine flattened and grew bigger. They still work, but it's just something to be aware of. I hope you enjoy this DIY shower jelly recipe! 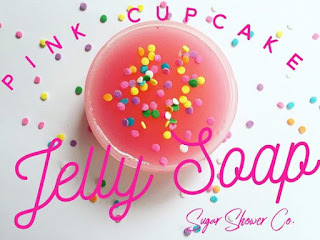 If you don't want to DIY this, there are some really cute shower jellies on Etsy that are handmade.